Home → Blog → Multi-dimensional transactions and rollbacks, oh my! One of the key features of the new guix pull is the ability to roll back to previous versions of Guix. That’s a distinguishing feature that opens up new possibilities. Transactional upgrades and rollbacks have been a distinguishing feature of Guix since Day 1. They come for free as a consequence of the functional package management model inherited from the Nix package manager. To many users, this alone is enough to justify using a functional package manager: if an upgrade goes wrong, you can always roll back. Let’s recap how this all works. Notice that python was not updated, so it’s shared between both generations. And of course, all the dependencies that didn’t change in between—e.g., the C library—are shared among all packages. Like I wrote above, guix pull brings the latest set of package definitions from Git master. The Guix package collection usually contains only the latest version of each package; for example, current master only has version 26.1 of Emacs and version 2.10.4 of the GIMP (there are notable exceptions such as GCC or Python.) Thus, guix package -i gimp, from today’s master, can only install gimp 2.10.4. Often, that’s not a problem: you can keep old profile generations around, so if you really need that older version of Emacs, you can run it from your previous generation. The nice thing here is that guix pull provides high-level information about the differences between two subsequent generations of Guix. then I know that I get the exact same Guix instance as my Generation 12 above. From there I can install diffoscope, emacs, etc. and I know I’ll get the exact same binaries as those I have above, thanks to reproducible builds. These are very strong guarantees in terms of reproducibility and provenance tracking—properties that are typically missing from “applications bundles” à la Docker. At this point your profile contains gimp coming from an old Guix along with packages installed from the latest Guix. Past and present coexist in the same profile. The historical dimension of the profile no longer matches exactly the history of Guix itself. Some people have expressed interest in being able to compose packages coming from different revisions of Guix—say to create a profile containing old versions of Python and NumPy, but also the latest and greatest GCC. It may seem far-fetched but it has very real applications: there are large collections of scientific packages and in particular bioinformatics packages that don’t move as fast as our beloved flagship free software packages, and users may require ancient versions of some of the tools. We could keep old versions of many packages but maintainability costs would grow exponentially. Instead, Guix users can take advantage of the version control history of Guix itself to mix and match packages coming from different revisions of Guix. 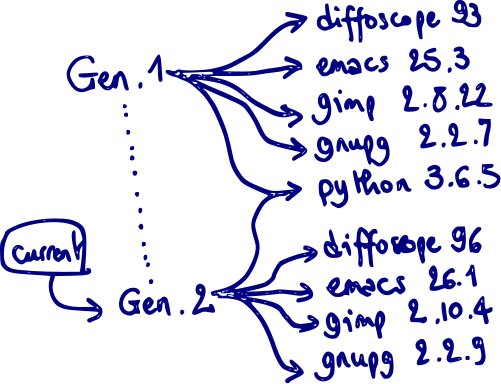 As shown above, it’s already possible to achieve this by running the guix program off the generation of interest. It does the job, but can we do better? In the process of enhancing guix pull we developed a high-level API that allows an instance of Guix to “talk” to a different instance of Guix—an “inferior”. It’s what allows guix pull to display the list of packages that were added or upgraded between two revisions. The next logical step will be to provide seamless integration of packages coming from an inferior. That way, users would be able to refer to “past” package graphs right from a profile manifest or from the command-line. Future work! The time traveler in you might be wondering: Why are package definitions coupled with the package manager, doesn’t it make it harder to compose packages coming from different revisions? Good point! Tight coupling certainly complicates this kind of composition: we can’t just have any revision of Guix load package definitions from any other revision; this could fail altogether, or it could provide a different build result. Another potential issue is that guix pulling an older revision not only gives you an older set of packages, it also gives you older tools, bug-for-bug. The reason for this coupling is that a package definition like this one doesn’t exist in a vacuum. Its meaning is defined by the implementation of package objects, by gnu-build-system, by a number of lower-level abstractions that are all defined as extensions of the Scheme language in Guix itself, and ultimately by Guile, which implements the language Guix is written in. Each instance created by guix pull brings all these components. Because Guix is implemented as a set of programming language extensions and libraries, that package definitions depend on all these parts becomes manifest. Instead of being frozen, the APIs and package definitions evolve together, which gives us developers a lot of freedom on the changes we can make. Nix results from a different design choice. Nix-the-package-manager implements the Nix language, which acts as a “frozen” interface. Package definitions in Nixpkgs are written in that language, and a given version of Nix can possibly interpret both current and past package definitions without further ado. The Nix language does evolve though, so at one point an old Nix inevitably becomes unable to evaluate a new Nixpkgs, and vice versa. These two approaches make different tradeoffs. Nix’ loose coupling simplifies the implementation and makes it easy to compose old and new package definitions, to some extent; Guix’ tight coupling makes such composition more difficult to implement, but it leaves developers more freedom and, we hope, may support “time travels” over longer period of times. Time will tell! Picture of a DeLorean cabin by Oto Godfrey and Justin Morton, under CC-BY-SA 4.0. That profile generations are kept around already gave users a time machine of sorts—you can always roll back to a previous state of your software environment. With the addition of roll-back support for guix pull, this adds another dimension to the time machine: you can roll-back to a previous state of Guix itself and from there create alternative futures or even mix bits from the past with bits from the present. We hope you’ll enjoy it!